Artists in the smooth jazz field often struggle to find a balance between creative progression and stylistic consistency. The outgrowth of more freeform jazz styles, it has over time come to serve as a sort of laid back alternative to contemporary soul and funk, incorporating influences from each while shading them with overtones of traditional jazz instrumentation and arranging. And like most modern-day formats, it has been largely commercialized in recent years by corporate interests, with its actual purveyors continuing to make steadfast efforts to deliver a sound that is both authentic and relevant. Guitarist Norman Brown has remained one of the most prolific players in the game for the past two and a half decades—both as a soloist and as one-third of the supergroup Brown-Whalum-Braun. His across-the-board appeal became quickly apparent with his early 1990s albums for Motown’s MoJazz label, making headway with both jazz and R&B listeners via smart renditions of Janet Jackson’s “That’s the Way Love Goes” and Stevie Wonder’s “Too High.” The momentum continued with a trio of understated yet hip sets for Warner Bros. in the late ‘90s and early 2000s (including the Grammy-winning Just Chillin’), while a subsequent period with Peak/Concord cemented his status as a defining performer in the smooth realm. His 2012 collaboration with Gerald Albright, 24/7, and the following year’s BWB set Human Nature: The Songs of Michael Jackson, served as additional testament to his ongoing creativity and prowess. 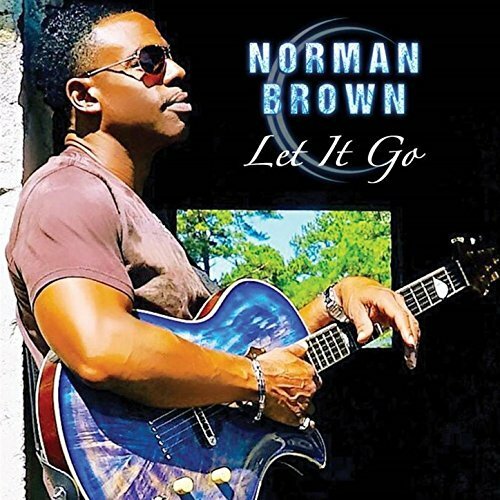 On his ninth full-length solo collection, Let It Go, Brown reaches out to his loyal fan base with a breezy and unaffected assemblage of tunes that emphasizes melodic efficacy over showy interpretation. The coasting title track provides a comforting atmosphere of his assured, easygoing way of playing embraced by gentle keyboard layerings and a warm drum track underneath. The swaying “It Keeps Coming Back” thrives on a similarly relaxing platform that is invested just a bit more in the groove. The snappy “Remember Who You Are,” featuring saxophonist Kirk Whalum, as well as “The North Star,” a kinetic entry with old-school flavor, also satisfy with well-executed rhythms and colorful melody lines. Sax man Marion Meadows adds vibrant harmonic embellishments to the latter. Many of Brown’s previous releases have highlighted both up-and-coming and established vocalists. Among the most memorable of these are his reading of SWV’s “Rain,” featuring the late Vesta up front, and “Not Like You Do” with Miki Howard on the mic. This time around, the much-loved Chante’ Moore guests, while Brown’s daughters, collectively known as Sisters of Unbreakable Love (S.O.U.L. ), also appear on several tracks. Unfortunately, these selections and several others don’t make the grade. Lacking the sharp focus of the instrumental numbers, the melodies seem to wander a bit and the production doesn’t do much to enhance the vibe. On “Holding You,” the vocals of both Moore and Brown are stylish, but end up meandering alongside the stagnant arrangement without ever reaching an impactful moment. To a lesser degree, but still somewhat below par, a fairly predictable cover of The Five Stairsteps’ perenially remade “Ooh Child” tends to lose muster by second verse. TrayCar’s lead performance here is pleasant, but doesn’t bring any especially energetic or fresh elements to the song. The slower “Conversations,” spotlighting S.O.U.L. and also including Brown’s own ad-libs and spoken segments, is more engaging—although the production value could use a little boosting. Let It Go is solid in most cases due to Brown’s dedication to his guitar craft. While the vocal endeavors are missing a certain flair, the well-crafted instrumental cuts make up for those weaknesses. Clearly, he is working within a smaller budget framework than on past endeavors such as 2004’s West Coast Coolin’ and 2007’s Stay with Me, wherein the presence of live components could be felt in different instances. However, given today’s limited scope of new smooth jazz product with true musicality, Let It Go renders itself a likable collection with several particularly notable standouts. Moderately recommended.